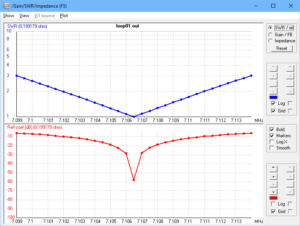 This article is a tutorial on using an NEC to model a small transmitting loop in proximity of ground. tuning capacitance 197pF with Q=1000 (ie 0.112Ω series R). Note that NEC-2 is more restricted in the size of segments for good results, and this same problem will require fewer / longer segments in NEC-2, and give slightly different results. The model tuning capacitance and frequency were adjusted to resonate at about 7.1MHz. 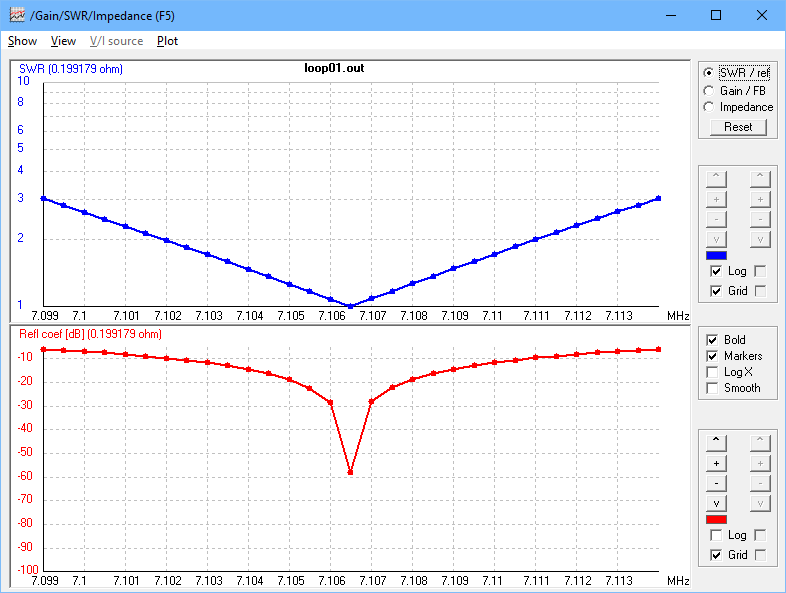 Above is a VSWR plot of the matched main loop, half power bandwidth (ie between VSWR=2.6 or ReturnLoss=6.99dB points) is 12.5kHz, and we can calculate Q=7106/12.5=568.5. A model run at 7.106 gives us several interesting metrics. Gain is 9.77dB, and as expected maximum gain is at the zenith. Above is the ‘home’ window of 4NEC2. Key figures here are Impedance, Efficiency, Radiation efficiency, and RDF. We will use them to calculate some key resistances. The perimeter of this loop is 0.074λ, and so the current should be almost uniform. Above is the current distribution, almost uniform. Larger loops show greater variation and that is one of the reasons why most simple calculators and design tools are so inaccurate. 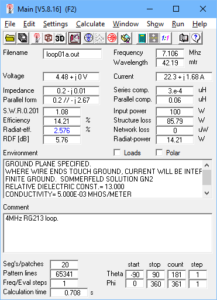 Impedance is shown as 0.2-j0.01, we are interested in the R part and due to the display rounding we need to dig into the NEC output report to find that it is 0.199179Ω. Structure efficiency is labelled Efficiency in 4NEC2, and the value given is 14.3%. 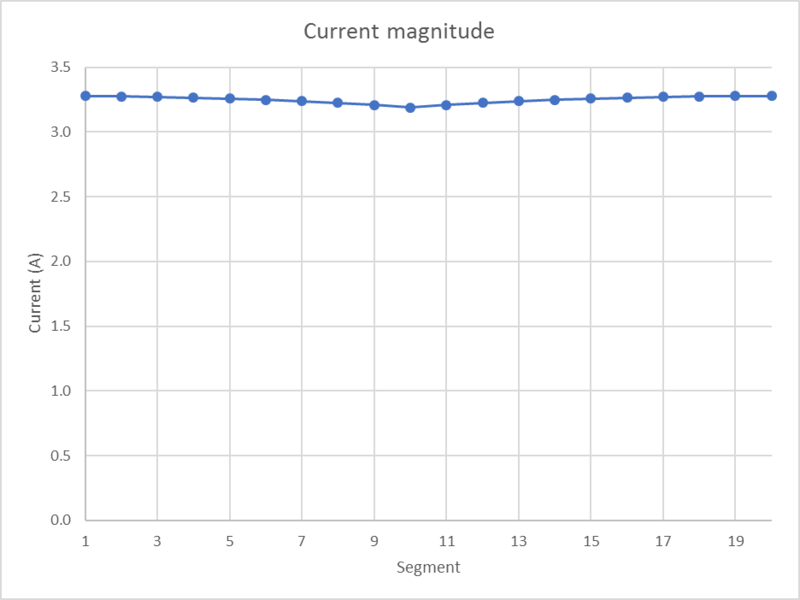 We can calculate the total equivalent loss resistance in the structure as (100-14.3)% of 0.199179Ω, it is 0.170Ω which reconciles approximately with 20 segments of 0.0033 and capacitor ESR of 0.112Ω. 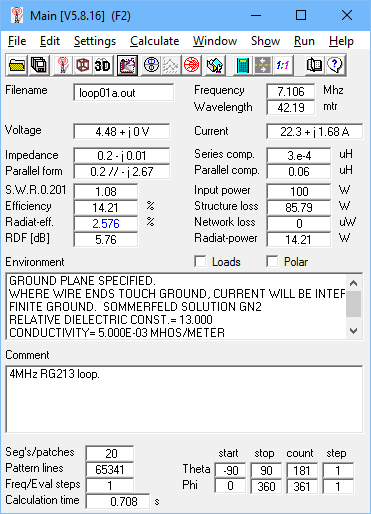 Note that because the current is not exactly uniform around the loop, these resistances will not add exactly to the feed point resistance, the loss component of feed point resistance is the calculated 0.170Ω. Radiation efficiency can be used to calculate the radiation resistance Rr. 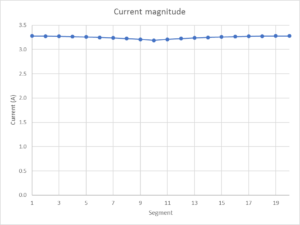 Rr=RadiationEfficiency%*Rin=2.576%*0.199179=0.005131Ω. We would expect Rr of this loop in free space to be around 0.006Ω (and it is), the value from the model is the result of proximity to ground. The gain figure reported in the pattern diagram is -10.1dBi, and given the relationship that Directivity(dB)=Gain(dB)-Efficiency(dB)=-10.1-10log(0.02576)=-10.1–15.89=5.79dB which reconciles (allowing for rounding errors) with the reported RDF. RDF is a ham term for what the rest of the world and good text books call Directivity. The chart above shows the distribution of equivalent resistances in this model. The radiation resistance is the only element that gives rise to radiation, just 2.6% of the input power is radiated. The interesting thing is that for this model, the capacitor loss is the largest element, and it is overlooked in most designs. It is often the things you leave out of a model that give rise to the greatest error. 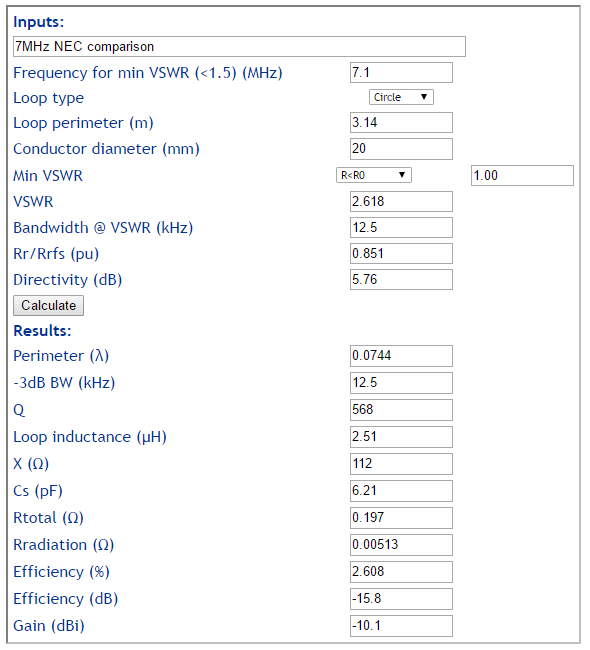 Using an adjustments for Rr/Rrfs (0.851), Directivity (5.76dB) and half power bandwidth (12.5kHz obtained from the NEC model, we can use Calculate small transmitting loop gain from bandwidth measurement to estimate efficiency and gain in the proximity of ground in this case. 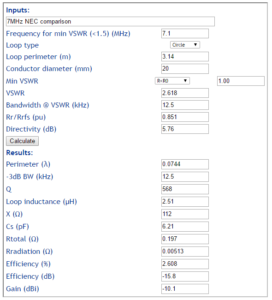 If one was to measure the half power bandwidth of an antenna constructed per model, the calculator could be used to estimate the gain and efficiency achieved. The calculated Rtotal will include differences in equivalent radiation, ground, loop conductor and capacitor resistances. 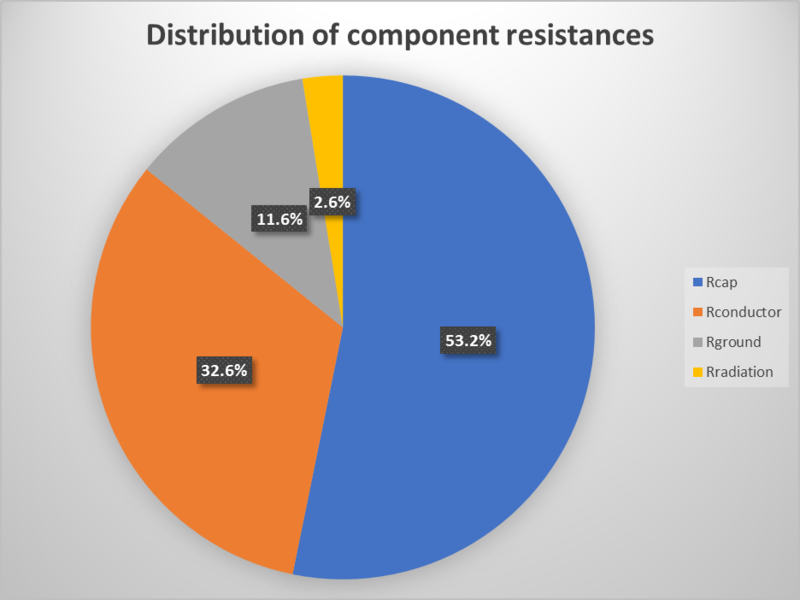 Radiation resistance is sensitive to ground type, but the other elements are likely to be the main contribution. One might ask why published VSWR curves often show half power bandwidth much greater than the models the designers have used and promote. Some designers and sellers are a step ahead of that question and do not publish VSWR curves, perhaps hoping that naive prospects may use the grossly optimistic calculators favoured by many STL enthusiasts. 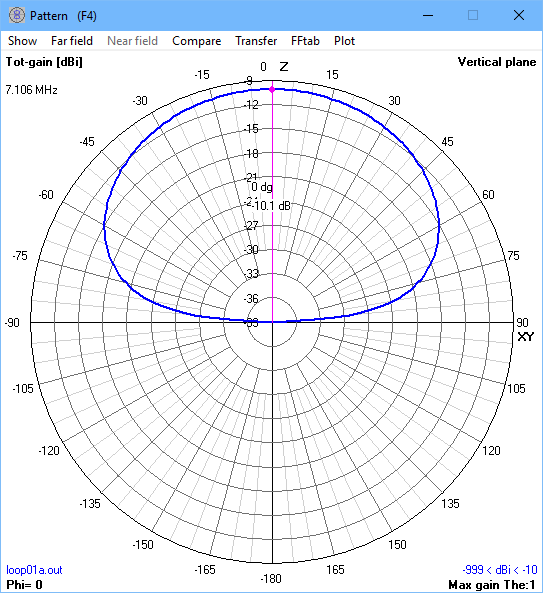 A valid field strength measurement at distances of 1 to 2λ can be adjusted for estimated ground attenuation and used to infer the radiation efficiency of the antenna, this is an even better technique but alas, I cannot recall seeing any STL seller publishing such information. Models are estimates of something in the real world, and only useful to the extent that they reasonably accurately represent the real world. A part of all modelling processes should be to reconcile the model with the real world, and as necessary adjust the model parameters so that the model does behave as the real world thing. Following through on reconciliation / validation of the model should expose the reasons for the different real world behavior, and it may expose incorrect assumptions of the real world components or even defects in them. Common assumptions about the loss resistance of the main loop (conductor, capacitor, and connections) are rarely borne out in published loop measurements. The loop conductor resistance is twice that of a copper conductor of the same size, and the Q of the tuning capacitor is taken to be 1000. You might think based on lots of published claims that it would be easy to improve on this with a copper conductor and vacuum capacitor, but you are unlikely to find published measurements of a loop of this size with Q much higher than obtained here. 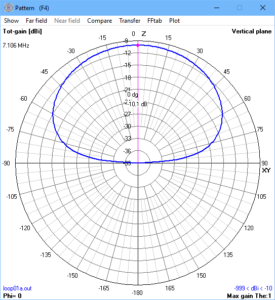 The model was not chosen to represent an ideal antenna, but to present a model that gives results similar to those of the best published antenna articles. A valid complete NEC model can be a very useful tool in designing a STL, particularly estimating the effects of proximity to ground. Measurement of in-situ half power bandwidth can be used to reconcile models with the built antenna. Ground wave field strength survey is an even better method of demonstrating radiation efficiency. Reconciliation with models may lead to understanding problems with assumptions made, and possibly identify faulty components.